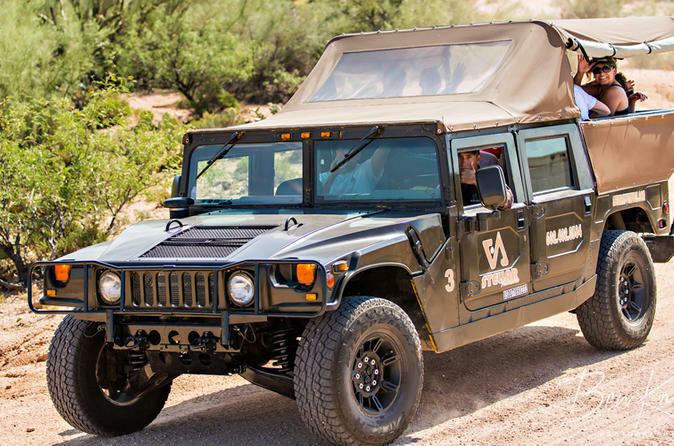 Immerse in the adrenaline rush of an EXTREME adventure which centers on the unmatched capabilities of the HUMMER. For example, the H1 can climb a 22” vertical wall, scale a 60-degree slope, traverse a 40-degree side slope, and ford 30” of waters (2 ½ FEET). We dare you to let us prove it! Apache legend claims that the entrance to the underworld lies somewhere in the Superstition Mountains. Other myths allege that deep in the heart of this craggy range lies a gold mine full of treasure. Come with us to find out whether that’s true on the Bulldog Canyon trail, which winds through the Sonoran Desert, offering panoramic views of the Superstition Mountains. The land in this part of Arizona is wild and untamed, but rugged landscape is no problem when you’re in the backseat of a Hummer H1. Sit down, buckle up, and hang on for nearly 20 miles of breathtaking desert vistas. One of the most beautiful characteristics of the Sonoran Desert is its versatility: One minute you’ll be hurtling along a dusty desert trail, only to find yourself fording a 2.5-foot-deep river the next. Don’t worry, the Hummer H1 isn’t afraid of a little water. Are you? No matter what terrain you encounter, your Chief Adventurer will keep you safe. You can set the pace by selecting either a Beginner or Advanced trail, but your experience will be outstanding no matter which option you choose. Your Chief Adventurer will help you learn more about the pristine, fierce beauty that surrounds you.